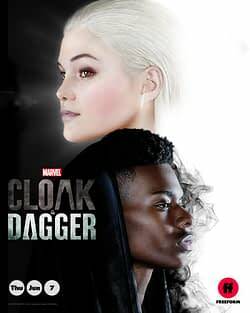 Marvel’s Cloak & Dagger started out big for Freeform, pulling in 1.64 million total viewers in the Live+3 data, making it the network’s best series debut in two years. It was also the most watched drama on the network since last years Pretty Little Liars finale. Even bigger was the premiere pulled in 7.3 million views across linear and digital platforms and has 112K engagements between Twitter, Instagram, Facebook and Tumblr. The premiere jumped 78% in total viewers over the same day data, the biggest bump ever for a Freeform premiere. The show went form 920k viewers over night to 1.64m three days later. The series stars Olivia Holt as Tandy Bowen and Aubrey Joseph as Tyrone Johnson – two children who were effected by an industrial accident only to rediscover each other as teenagers and find that they have superpowers that link them together. Tandy can create light daggers and the the best of people while Tyrone controls the darkness, allowing him to teleport and see peoples worst fears. In the two-episode premiere, we learned about their families and who they are individually, but we are just now seeing them come together as the series progresses. The 10-episode first season is being showrun and executive produced by Joe Pokaski (Heroes).